The stretch of the Nile Valley that runs from Aswan, past the great Philae Temple dedicated to the goddess Isis, which was dismantled and reconstructed on Agilikia Island before its former site, Philae Island, was flooded when the old dam was constructed, onwards past the Aswan Dam and the huge manmade lake, Lake Nasser, comes to a halt at Abu Simbel. The town is around 280 kilometres from Aswan and some 100 kilometres from the Sudan border. 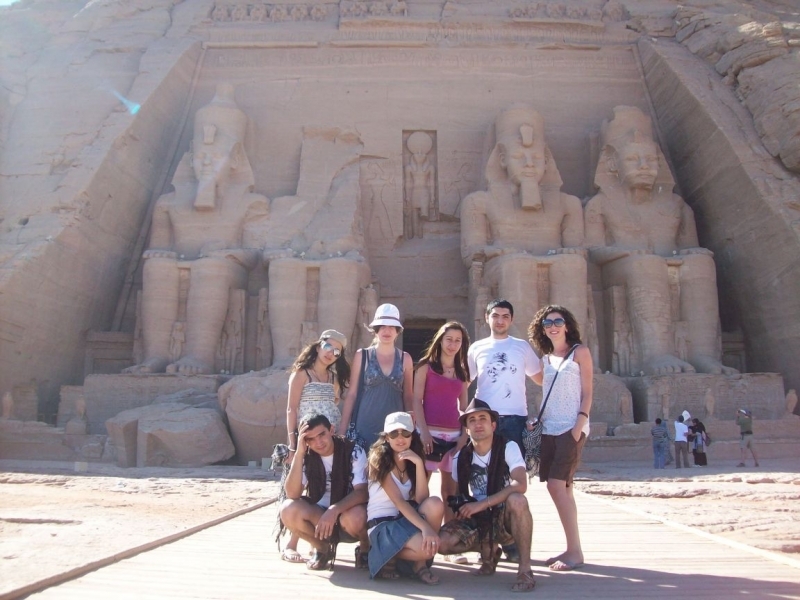 Abu Simbel is best known for its two magnificent temples that were originally carved out of solid rock on a mountainside way back in the 13th century BC. An UNESCO World Heritage Site, they are known as the Nubian Monuments and dedicated to the great deities of the day Ra-Horakhty or Horus, Ptah and Amun. 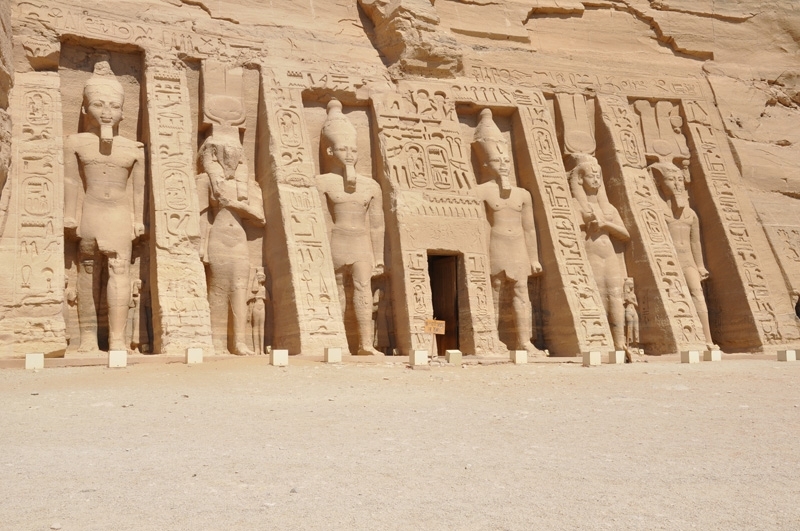 They were built to honour the great pharaoh Ramses II and his wife Nefertari. 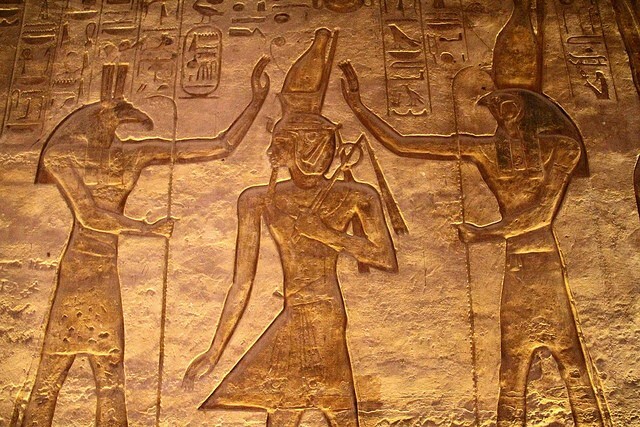 Such was their historical importance and the glimpse they gave the world of an ancient civilization that when the new dam was built to regulate the waters of the Nile, and create the massive Lake Nasser, the temples were the subject of much discussion. A subsequent rise in water levels threatened to submerge them. A mammoth project to save the temples was conceived and work began in the early 1960s. UNESCO stepped in with expert knowledge of ancient buildings, as well as funds created largely from international donations, and managed the project to relocate them to a hill high above the water level of the new lake. The project was a lengthy, but highly successful, one. Massive blocks of rock were cut, dismantled and reassembled over a period of several years. The temples were, literally, cut from the mountainside and moved to higher ground. They were positioned against manmade semi domes so that the statues on the front facades looked out over the waters as they have done for centuries. 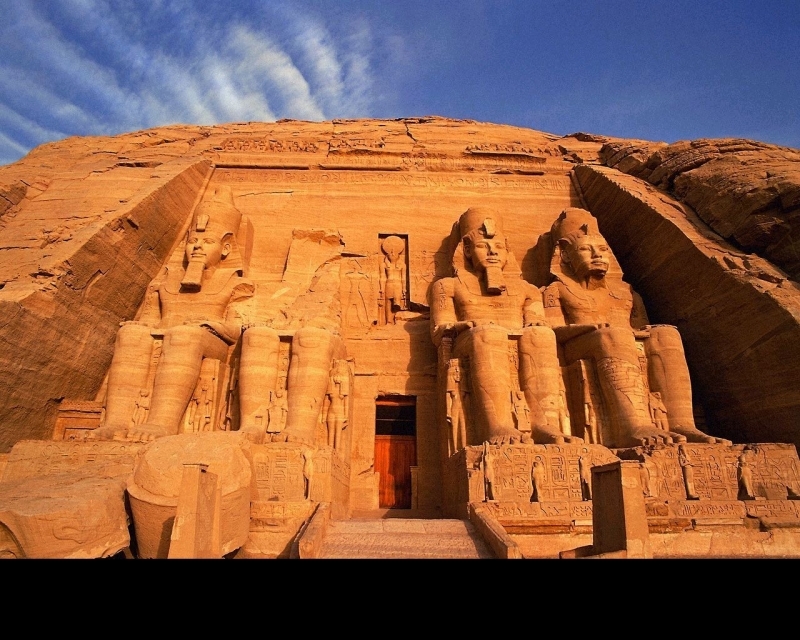 The temples, known as the Great Temple of Abu Simbel for Ramses II, and the Small Temple of Abu Simbel for Nefertari, date back to Pharaonic Egypt and the reign of Ramses II. As the story goes, he wanted to create a lasting monument to his reign, and that of his queen Nefertari. A victory at the Battle of Kadesh proved the perfect opportunity to build the complex. It is believed that work started on the great temple in the mid-1200s BC and took around 20 years to complete. The smaller temple’s construction started a little later. 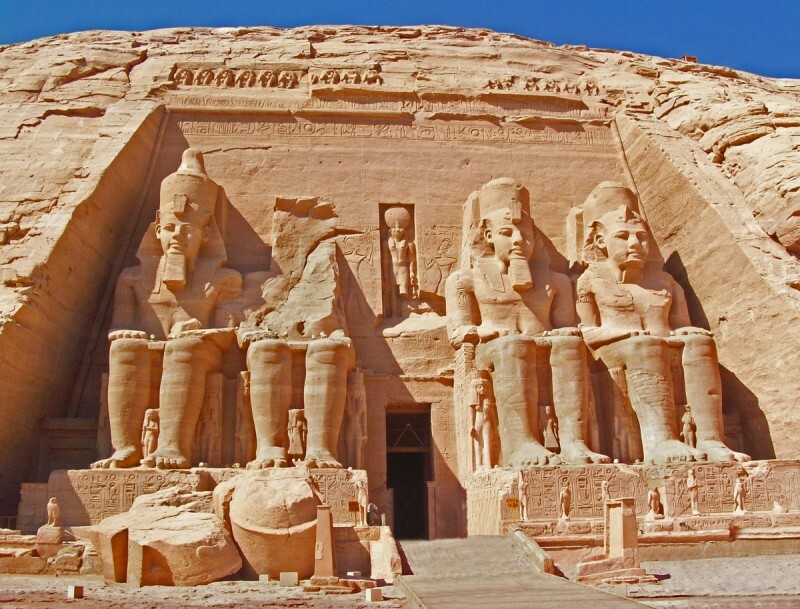 At the entrance to the largest temple there are four mighty statues of Ramses II in which he can clearly be seen wearing the double crown of the Upper Egypt and Lower Egypt regions. They are some 20 metres high and, astonishingly, were delicately carved from the rock of the mountainside where they originally stood. Sadly, one is badly damaged, but it does not distract from their magnificence. The temple’s frieze is way above their heads. There are various scenes of battle, including one of Qadesh that show Ramses II’s victories. There are many statues within the complex, including those depicting his wife Nefertari, his sons anddaughters, and the deities to which the temple is dedicated. The temple was, in fact, built on an east-west axis so that the early morning sun reached the inside of the temple and shone on some of the statues it contained. This is particularly evident on February 22 and October 22 every year. The smaller temple to Nefertari, sometimes referred to as the Temple of Hathor, stands 50 or so metres from the great temple. 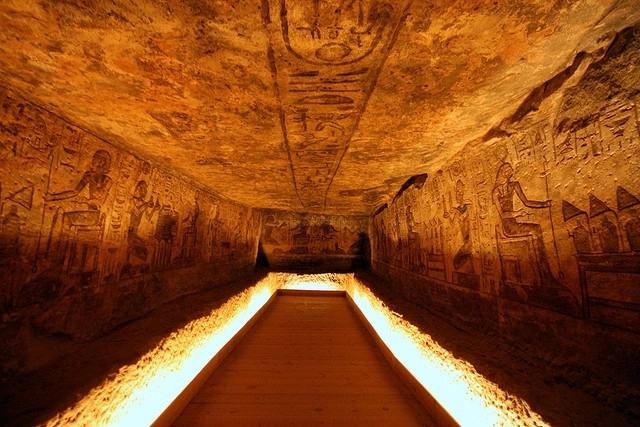 It is beautifully decorated with scenes of Ramses II and his wife making sacrifices to the gods, as well as statues showing the pharaoh and Nefertari. Interestingly, unlike other statues from ancient Egypt where a pharaoh is depicted with his queen, the statues are the same size. Traditionally, the queen was always at knee height to the pharaoh. 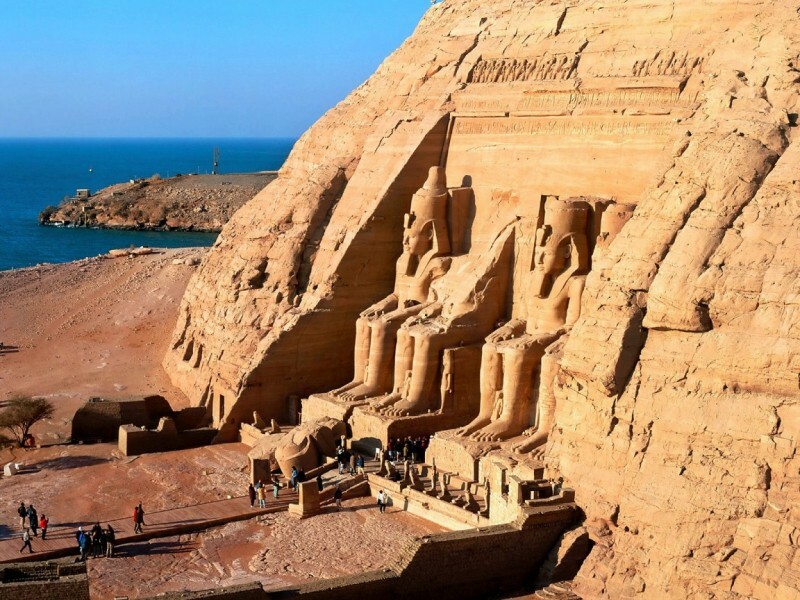 At the time they would have been important monuments, but as subsequent dynasties took the reign, and invaders from around the world made their mark on Egypt, the temples of Abu Simbel became all but forgotten. Over many centuries the winds of the desert whipped up the sand until eventually the temples were covered. In 1813, the temples were discovered lying under a massive layer of sand by the famous Swiss traveller Johann Ludwig Burckhardt. He spotted the top frieze of the largest temple and so began the work to unearth them.